I met the lovely Adam Wallace at KidLitVic in 2017 (a great Australian kidlit writers’ conference if you’re looking for one), and was immediately impressive by Adam’s contagious enthusiasm and love of children’s books and writing. 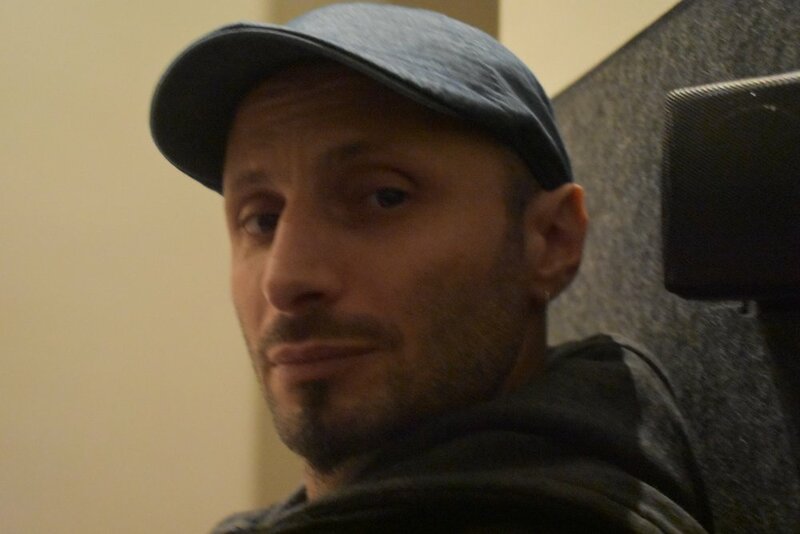 Today, Adam is stopping by my blog to chat about his latest book, upcoming projects, writing inspirations and processes, and more. Plus, you have a chance to win a copy of Adam’s new book - details at the end of the post! Yes. Yes I can! The book is called Invisible Jerry, and it’s a bit of a departure from my normal style of book. It’s kinda nice and sweet and a little whimsical even, about a boy, Jerry, who feels invisible, who’s never seen, who doesn’t really want to be the centre of attention, but doesn’t want to always be left out either. What was the inspiration behind writing or illustrating this particular story, and did it change much as you went? This was quite an incredible experience. The idea came about when a child said she had been playing basketball, and no one passed to her, even when she was calling and open. It made me think of times I had said something or been somewhere and had been ignored as a child, and adult. I was away, and staying in a hotel, and I sat with my phone, and I wrote the story, and honestly, it just came out. Straight through, like it had been in me just waiting for me to find it. Even as I worked with the publisher, EK Books, there weren’t many changes. I hope they can relate to what Jerry, and then Paul, feel, either from personal experiences or from recognising others in it. I also hope they see that if they do feel invisible, it isn’t that there is something wrong with them, it’s just the right people haven’t seen them yet. Giuseppe Poli, the illustrator, and I have done a number of teaching notes, with the help of my best friend, the incredible teacher Bree Monks, and they will be available, but I guess just in general whether there is something people can do to make someone feel seen. It doesn’t have to be a big thing, but it can change someone’s day. Biggest challenges in writing/illustrating this story, or in getting it published? Biggest challenges in publishing/being a creative, in general? I was really lucky in that EK Books were the first publisher I sent this story too, and they accepted it, but it was not the first story I had sent them! So the challenges had come before, rather than with, this story. I could tell you how many rejections I have had but I don’t know if the page is big enough for the number. It’s in the millions. Let’s leave it at that. Aside from getting published, I think the biggest challenge is, in fact, being seen. This could be by publishers, but then when the book is done it’s about being seen among the thousands of other books published every year. Are there any tidbits from the publishing process of this book that you could share with regards to working with the publishers and/or the illustrator or author? It was a really lovely experience. Everyone who came on board was really enthusiastic about the story, and Giuseppe was an absolute delight! It was also really nice as I was involved in the whole process, which isn’t always the case. So I saw rough illustrations, character designs, early layouts, everything. Yes. Yes I can! I have a few books coming up, which is really exciting! I am currently working on 2 books for next year with James Hart, called Cowboy and Birdbrain. These are coming out with Scholastic, the first in March, the second in August, and they are sooooooooooo fun to work on, and James is a legend. I also have a Christmas book coming out with a company in Slovenia, which is a personalized book, but I don’t think that will be available in Australia just yet … I will try and find out! I also have another Christmas book, The Holiday Heroes Save Christmas, coming out, and How to Catch a Turkey, both through Sourcebooks in the USA. And I am currently working on a book called Rap School, and then will move into a story I have started called Stick (It to the) Man. I think that’s it for now … oh, I will also need to finish a new How to Draw book before December, so it can be out early next year as well. Oh … no, that’s it. I have been super lucky to have brilliant, amazing authors that have offered me advice and support. It’s an amazing community, the children’s book community in Australia. People like Leigh Hobbs, Andy Griffiths and Terry Denton, Michael Wagner, Tania McCartney, Paul Collins and Meredith Costain, and so many more have all been ultra generous and are just lovely, wonderful people. Also I love The Simpsons. And Roald Dahl. When I was a kid I looooved Bill Peet books, and still do. I have a collection of them still. Of current books, my second favourite book of all time is Stargirl, by Jerry Spinelli, another wonderful, generous man I have been lucky enough to be in contact with. Stargirl is also one of my favourite characters. She’s brilliant. Love that Dog is also incredible. Can’t remember who wrote that one. And I love the 13 Storey Treehouse, and So Wrong, and Stuck, oh Stuck is my favourite picture book! I actually saw a kite stuck in a tree on the weekend and we started reciting Stuck! Ha, just kidding, of course I can! I once had my finger jammed in a train door in London, when I was 6, and still have the scar! Do you know what? I reckon the best thing about being a writer is I can and have written ANYWHERE! I have written on trains, and in cafes, and at red lights, and at my desk, and on my couch, and on planes, and in hotels, and I have written in notebooks and sketchpads and on computer and on my phone and I have jotted down ideas on my hand and on shopping dockets and on my phone and I have recorded ideas verbally. My only ritual is I write every day. I have to. I need to. And I do like to write in the morning if I can. That way I am done for the day, and if I do more, great, if not, doesn’t matter. A number of things. I wanted to work with children, I was bored with being an engineer, teaching was an option that didn’t pan out, and once I wrote my first story, in 1999, I was hooked. I never thought it would become a career, not at first, but then it seemed like the only sensible thing to aim for. Work every day. The only thing you can control is how hard you work and how good your work is. Focus on getting your writing better. That is more important than shiny websites and Instagram posts and photos. In the end, it’s about the stories you create and the connection you can make through that story. Also read The Artist’s Way, by Julia Cameron; On Writing by Stephen King; and if you ever get a chance to do an improvisational comedy course, it has been one of the best things I have ever done, for my writing and my presentations and life in general. This doesn’t mean you have to jump around and be funny if that isn’t you, it’s about removing blockages and fear of failure. What's something you wished you had known earlier in your career? Adults laugh at the same things as kids. I always tried to be serious when talking to adults, which made me feel uncomfortable and inauthentic. Best investment you've made during your career? Improvised Comedy courses. Also the first book I self-published. It proved to me I had something worthwhile, but also proved I had the desire and initiative and guts to go for it, scary as it was, and that was a really important step for me. Oh, sooooo many, but my favourite one, which I have tattooed on my arm, is from Bruce Lee – Be water, my friend. 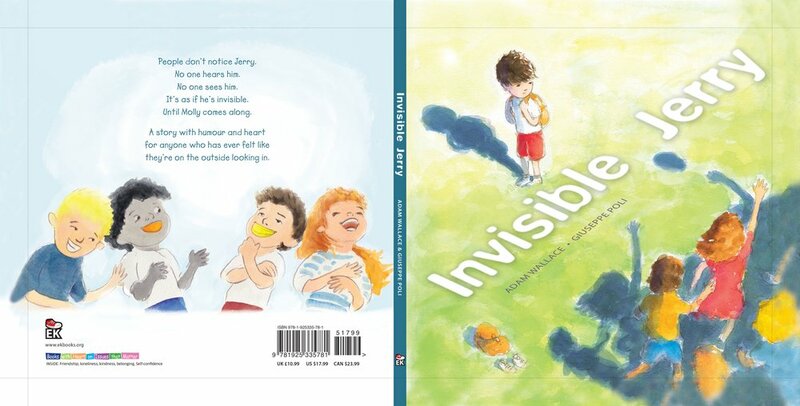 Adam has kindly offered to give away one SIGNED copy of Invisible Jerry to a lucky reader of this blog! How fab is that?! I’ll draw one winner by random, and notify them of their win by via social media. Please follow/friend me so that I can DM you to get your address details.